Cami has a phobia of boogers. There is even a name for this: blennophobia. 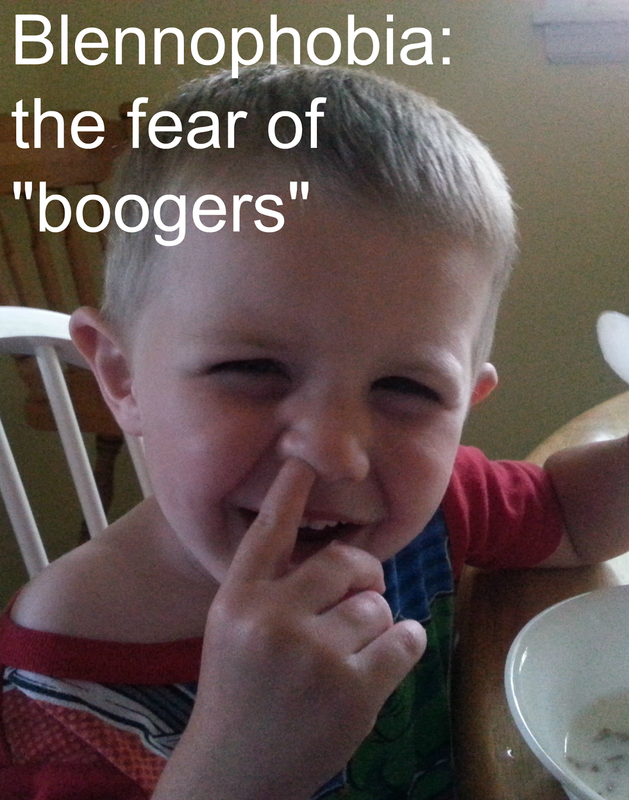 I, however, have no such fear of boogers. I don't particularly like or want others peoples boogers but if I see someone mining for green gold (picking their nose) I don't freak out. Cami does. She gets particularly upset with me and boys when we will purposefully pick our noses in front of her just to bother her. DISCLAIMER: I do not pick my nose in public (generally). While nose picking is perfectly natural and everyone does it, I don't care how much they deny it we all pick our noses, I don't think it is polite to do so in front of others...except for Cami. The older boys learned long ago that if they want to get a great reaction out of Cami all they had to do was threaten to wipe a booger on her and she'll run away yelling at them as she goes. Sometimes they'll chase her around the entire house. Torturing Cami is like a favorite family past time now. She vehemently denies enjoying it but I don't believe her. I think deep down she loves it and just won't admit it to us. So we've been married for eight years now. I try to think of creative ways to bother or annoy her to remind her how much I love her (I have a saying, it is: I tease you because I love you). The way I figure is that me thinking of ways to tease her shows her that I am thinking about her and that should, therefore, remind her how much I love her because I spend so much time thinking about her. After eight years I have come up with lots of fun and creative ways to bother my sweetheart. But yesterday I may have discovered the best one yet. I just can't believe it took me so long. Here's what happened. We went to our church building to pull have a picnic and pull some of the weeds that were growing in the landscaping as our family home evening. Due to the hot weather and being in the sun we were covered in sweat when we arrived home. The kids took baths, we said prayers and read scriptures, put them in bed, and Cami and I ran for the shower. I got out first, dried off, and got dressed. I came back to the bathroom to hang out and talk to her while she finished her shower (we do that a lot, we just can't seem to spend enough time together). While we were talking something started irritating the inside of my nostril. I investigated and found and removed the culprit. As I reached for a tissue out of the corner of my eye her towel caught my view (it's bright pink so it's hard to miss) and immediately an idea jumped into my head. Yep. And I did it too. Now lest you think me a horrible person and unfit husband I assure you I place it strategically. This was merely for psychological effect. It was located behind a fold at the edge so as to never come into contact with her directly. If I didn't do it this way I knew I would never be forgiven. About an hour after she hopped out of the shower and was done dressing and brushing her hair I shared with her the news. Her reaction: priceless. She didn't talk to me for at least twenty minutes. Just sat glaring at me. It has been some time since she's been that angry with me. After I finally got myself under control (I broke into gut wrenching bouts of laughter about every time I looked at her) I explained that the booger never touched her body. Didn't make a difference. I tried reasoning with her. I tried getting her to laugh at the situation. I tried ignoring that she was mad at me to see if she would thaw. All of my usual tricks. To no avail. At long last she simply stated: "That is so disgusting. I can't believe you did that. You know how much I hate boogers. Promise me you'll never do that again." I hemmed and hawed for a couple of minutes and finally gave in. I pinky swore that I would never do that again. Because I am a man of my word I am done putting boogers on her towels forever. The sacred pinky sware, as we all learned in elementary school, cannot be broken. The moral of the story is forgiveness...and having a great sense of humor...is a fundamental part of every marriage. If you won't or can't forgive then something is wrong (the same is true for laughing). p.s. I know that Cami and I will laugh about this "incident" someday. It may be a few years but we will. I am still freakishly mad at you. Don't you dare think it is funny. You are a punk. A nose picking, bogger wiping punk. I love you, but I am still mad at you. I may in like 20 years laugh about this, but for now you just get a smirk. Happy Birthday to the Loveliest Woman!